California State Parks is proposing new language for its Public Resources Code that will negatively impact trail access for mountain bikers. The proposed code change reads: "Unless designated by the Department, all trails are open to pedestrians and closed to all other uses." TAKE ACTION! A public comment period to address this is open until April 4, 2014. Please send an email to those listed below by April 4, 5:00 p.m. PST. Implore them to deny this proposed rule change and provide singletrack trail opportunities for mountain bikers. Read on for additional information, suggested talking points and relevant contact information. Since 1988, Calif. State Parks has operated under a similar policy stating that trails are closed to bikes unless "specifically opened." Local state park units have generally failed to "specifically open" trails, and IMBA does not believe this situation will improve. IMBA will be proposing alternative wording for the Public Resources Code that would open state park trails to non-motorized users unless specified (see below). Please join us in letting park officials know that effectively restricting trail access without review is unnecessary and unwarranted. This change sends an unwelcoming message to the public who want access to their state parks, which is contrary and inconsistent with other stated policies that stress a welcome greeting. It will limit future opportunities for thousands of mountain bikers because superintendents will not be required or compelled to open trails to bikes. Historically, superintendents have been reluctant to open trails to bikes under the existing policy. It will decrease outdoor opportunities for the public just at a time when exercise is encouraged as a way to deal with the epidemic of obesity. It will negatively impact the thousands of youths in the state who participate in school mountain bike leagues. It will alienate state park supporters and an entire generation of young people that want and need to access the outdoors. It directly contradicts efforts of the Parks Forward Committee that is studying ways to make state parks more responsive to the needs of communities. It ignores real-world success stories in Calif. that demonstrate how shared trails enhance quality of life for thousands of state residents. State park trails are open to non-motorized users including hikers, bicyclists, and equestrians unless otherwise designated. Trail use designations are established based upon user needs, visitor safety and environmental sustainability. This includes access to trails in Reserves and Preserves, as defined in PRC Sections 5019.65, 5019.71 and 5019.74, where particular emphasis will be placed upon importance of public access to the area, or desirability of providing important connections to other trails, provided impacts to special resources for which the area was established will be less than significant. AERC Trail Master Class ($225/limited to 16 students) will be held June 21-24, 2014, in Duluth, Minnesota. Must be an AERC member in good standing for at least one year. Contact Candy Barbo for more information 218 349-9606 or candy.barbo@gmail.com. AERC sponsors Trail Master classes across the U.S. In addition to teaching endurance riders the proper way to design and build new trails -- and maintain and improve existing trails -- we invite two land managers to attend the class with riders. Mornings are spent in the classroom. A written test follows at lunch, and afternoons are set aside for field work and getting one's hands dirty. Those who graduate from the four-day course are certified crew leaders, and can go anyplace to lead crews in the proper way to maintain, build and design trails. By working together with our land managers we can build sustainable trails for the future. Christoph Schork (Global Endurance Training Center) will offer a free hoof care clinic on Saturday, May 24 from 4:00 PM – 6:00 PM. Christoph will demonstrate various hoof trims for barefoot riding, shoeing, booting, gluing. He will also demonstrate and answer questions about the newly released EasyShoe. Various hoof protection methods will be on display and explained, followed by a demonstration of an Easyboot or EasyShoe gluing on two hooves. Questions will be answered and participants can bring their own horses for a free hoof and trim evaluation. Don't miss this event! Mark your calendar for Saturday from 4:00 PM – 6:00 PM at the Owyhee Base Camp. And be sure to join us Friday evening for a Welcome Wine & Cheese party sponsored by Vettec! The Arabian Racing Cup is pleased to announce the nominees for 27th annual Darley Awards, sponsored by HH Sheikh Mansoor Bin Zayed Al Nahyan Global Arabian Flat Racing Festival. Honoring the best in the US in Arabian flat racing in 2013, the US champions will be named at the Her Highness Sheikha Fatima Bint Mubarak Darley Awards Hollywood 2014 celebration to be held at the Dolby Theatre in Hollywood, California on the evening of April 4, 2014. Often referred to as the "Oscars" of Arabian racing, sharing the spotlight on the Dolby Theater stage that evening are the HH Sheikha Fatima Bint Mubarak Darley Awards for Ladies. These elite international Awards are presented in the name of Her Highness to outstanding women in Arabian racing globally in 2013. Ms Lara Sawaya, Executive Director of the HH Sheikh Mansoor Bin Zayed Al Nahyan Global Arabian Flat Racing Festival, will announce the Ladies finalists in the eleven categories in the coming weeks. These awards are determined by an international panel of distinguished judges from 8 countries, including the UAE, United Kingdom, Bahrain, Egypt, Qatar, Lebanon, Netherlands, and United States. Chartered in 1983, the Arabian Racing Cup is a nonprofit corporation founded by Dr. Sam Harrison and directed by its Board of Stewards. The Cup is dedicated to the international promotion of Arabian Racing, and in 2012, joined together with the HH Sheikh Mansoor Bin Zayed Al Nahyan Global Arabian Flat Racing Festival to promote this prestigious Darley Awards event. Supported by an extensive list of international sponsors, the Darley Awards are under the direction of Lara Sawaya, Executive Director of the Festival, and organized by Arabian Racing Cup, the Abu Dhabi Tourism & Culture Authority, coordinated by Abu Dhabi Sports Council, in association with International Federation of Arabian Horse Racing Authorities, Emirates Racing Authority, Emirates Arabian Horse Society, and supported by General Authority of Youth & Sports Welfare. Emirates Airlines is the official carrier. In light of the aging population in endurance riding and the need to recruit new members, enthusiastic new AERC board member Rusty Toth has launched a new blog, "Why Endurance?" "The blog was my idea, born out of the AERC Membership Committee," says the mountain region's Toth, a national and international endurance rider, Tevis Cup and Haggin Cup winner, who first began riding endurance in 1999. "The idea is to inspire riders to either try a longer distance or possibly step up the speed in a safe way, and to encompass the big tent of endurance, showing that it is okay to be a 'hot shoe' and a 'back-of-the-packer.' The blog will include helpful information to responsibly guide the 'middle-of-the-pack' rider who may want to start riding for Top Ten completions. "We also want to reach out to our younger audience, as AERC endurance is an aging demographic," Toth continued. "For the future of the sport we need to revitalize our youth and capture new riders in the sport at a lower age segment. "I am reminded of a story of fellow BOD member Tom Bache, having competed in the Twenty Mule Team 100-miler this February, riding much of it with a 19-year old-lady. A 70-year-old man and a 19-year-old lady riding a 100 and finishing Top Ten together, that is our sport; everyone. "You can be a junior or senior, fast or slow rider, and it's all endurance. It's all this glorious sport shared with our best equine friends." Darryl Downs, 27-year-old 3000-mile endurance rider from the northeast region, is the first blog poster. In less than 20 hours since its launch, the blog already has over 1000 hits. A Lane County, Ore., horse has died from and four others from the same stable have tested positive for neurologic equine herpesvirus-1 (EHV-1), Oregon animal health officials announced late yesterday (March 10). A statement from the Oregon Department of Agriculture indicates that all 10 horses residing on the affected property have been quarantined, and those showing signs of disease are being treated. There is no indication that the virus has spread to other horses beyond those being quarantined, the statement said. LeaMaster said the exposed horses have not been moved from the property in more than two months. The horse that died had originally been purchased from an owner in Benton County, Ore.; the previous owner has been contacted and reports no signs of illness in any of their horses. Endurance Day on Horses in the Morning Radio Show! AHA base membership will increase to $40 on April 1, 2014. Dues have not increased since 2002. The current three year rate of $70 will also go up. If you are a current member of AHA you can lock in the $25 rate if you renew now even if your membership does not expire till later this year. If you are planning to be involved in any Arabian Horse Association shows or AHA sanctioned endurance rides this year either as an owner, exhibitor or trainer, you need to have ...a membership with the association. A nonmember show fee for just one of the AiM shows this year is $35 so you may consider an AHA membership. If you affiliate your membership with a club such as AiM (club number 4230) your competition card is $35 not $60. A competition card is required to participate in shows. Although equestrians share the trails with many other types of users, horseback riding is the original use for many of the trails and public lands we enjoy today. Not only does Back Country Horsemen of America protect our right to ride horses on public lands, they seek to preserve those historic trails our predecessors traveled. Some ambitious Back Country Horsemen are planning a 1200 mile horseback ride along the Old Spanish National Historic Trail through California, Nevada, Arizona, Utah, Colorado, and New Mexico. The trail takes its name from the Spanish colonies in northern New Mexico and southern California that were linked by this rugged route from 1829 to 1848. Traders exchanged woolen goods made in New Mexico and mules, horses, and donkeys from California. The BCHA ride will commemorate the historical and modern day significance of this trail. The primary objective of the journey is to educate folks about the importance of protecting equestrian access to our nation’s public lands and BCHA’s leading role in that endeavor. They also hope to inspire a zeal for preserving the treasures of our American heritage, such as the Old Spanish National Historic Trail, that still survive across the nation. Many of today’s trails, public lands, and paths were forged specifically for travel by horseback, long before hiking and mountain biking were invented. These byways have been a part of the landscape for numerous generations, and with our attention, for numerous generations to come. Although at this point plans are not yet finalized, Back Country Horsemen of America expect a core group of around six people to ride the entire route, with many others joining at various places along the way, for as little as a day or as long as a week or two. They’ll travel the first 600 miles from El Pueblo de Los Angeles, California, to central Utah in the fall of 2014. They’ll trek the second 600 miles from central Utah to Santa Fe, New Mexico, in the spring and summer of 2015, after the snow melts in the Utah passes. Traveling through deserts and mountains, Indian reserva­tions and National Forests, BCHA riders expect to average 20 miles each day with one rest day a week, completing the trip in 60 to 70 days (with allowances for unexpected delays). In isolated areas, pack horses and mules will carry their equipment and supplies to the next camping spot, replicating the way the original traders traveled the route. Back Country Horsemen in California, Nevada, Arizona, Utah, Colorado, and New Mexico will assist with finding the route, choosing camp sites, acquiring supplies and services, and other tasks requiring local knowledge. Richard Waller of Back Country Horsemen of California, Los Padres Unit, will put his considerable experience and skill to use as the ride’s Trail Boss and Chief Planner. To further share the story of their ride and the need to save cultural gems like the Old Spanish National Historic Trail, a book will be written about the trek and camera crews will film the journey to create a movie. Updates on the riders’ progress during the trip will be placed in the media and online to allow the public to experience the trek along with them. To learn more about Back Country Horsemen of America’s Old Spanish National Historic Trail Trek, go to http://wanderingthewest.com/old-spanish-trail/ost.html or find them on Facebook: Backcountry Horsemen Old Spanish Trail Trek. If you want to know more about Back Country Horsemen of America or become a member, visit their website: www.backcountryhorse.com; call 888-893-5161; or write PO Box 1367, Graham, WA 98338-1367. The future of horse use on public lands is in our hands! Reporting for AERC, intrepid roving reporters Ken and Julie Herrera are roaming the seminar halls of the 2014 AERC "Horses First" Convention in Atlanta, Georgia, showing everyone who is not in attendance a taste of what they are missing, including vendor hall and Hot Topic meetings, interviews with vets and riders, snippets of different talks, parties and awards banquets. Two motions up for consideration by the board of directors at the AERC Convention in Atlanta this weekend concern the Equine Welfare Reform Package and the AERC Notice to FEI Sponsorship Committee Motion. EQUINE WELFARE REFORM PACKAGE MOTION BEFORE THE BOARD: The Veterinary, Research and Welfare of the Horse committees are proposing the Equine Welfare Reform Package motion -- please read it over and make comments to your board representatives. Discussion will take place at the convention board meetings. Click for the Equine Welfare Reform Package Motion. Also up for consideration by the board of directors at their convention meetings is the Sponsorship Committee Motion: AERC Notice to FEI, which is now in its final version before presentation to the board. Please read it over and make comments to your board representatives. Click for the Sponsorship Committee Motion: AERC Notice to FEI. 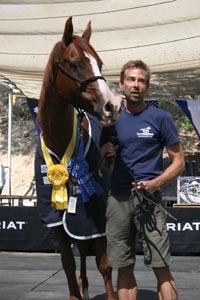 Colorado horse Awesomes Fire N Ice has received the USA’s highest endurance award for the second time. With a single headlamp shining the way, Cindy Collins of Cody climbs the mountain atop her chestnut Arabian mare, AUR Sierra Wind. The lights of the society she and Sierra came from glow below in the distance as the clop of Sierra’s shoes moves them both forward into the darkness and away from the safety of humanity. Collins holds back the growing motion sickness, ignoring the swinging of the headlamp’s light. The trail ahead sways because of the swinging light, like a boat on the sea, but Collins deals with it. 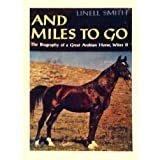 And Miles to Go: The Biography of a Great Arabian Horse, Witez II by Linell Smith is a collector's item! Witez II, purportedly the most magnificent Arabian horse ever, was born in Poland in 1938 and survived the Nazi, Russian and American invasions. This is his story--a gallant one--told with irrepressible sentiment. Any youthful interest aroused by the general aura of the stable will be squelched by the appearance of the young twins Stacia and Stasik, both of whom utter only deathless prose. Stacia and her Babka (grandmother) are both clairvoyant, so that the grim future is always agonizingly clear. There are some interesting scenes which present the plight of Poland first under the Germans, then caught between the Russians and the Americans, but the alternately pedantic, rhetorical, and tearful style obstructs appreciation. Witez never emerges as more. than a sweet-tempered, adored specimen, even after the sudden (tragic) disappearance of the pompous twins., as one after another human falls under the spell of his beauty. Share the journey and share the buckle! First time finishers in 2014 may choose to receive a historic buckle at this year's Awards Banquet on August 10th. Each legacy buckle is engraved with the year and the name of the horse and rider team that earned it. Legacy buckles as far back as the '60s are being donated very generously by multi-time finishers to the Western States Trail Foundation for this purpose. These donors include Tevis Cup and Haggin Cup winners, as well as riders of unusual breeds. To learn more about earning a legacy buckle in 2014 or to donate your buckles for this worthy project, please contact Kathie Perry, Chuck Stalley, Barbara White or wstf@teviscup.org.